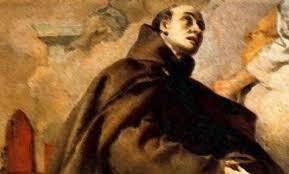 Paschal was a Franciscan lay brother who became famous for his devotion to the Blessed Sacrament. 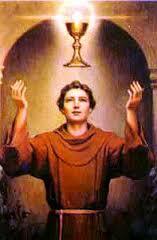 Paschal was a Franciscan lay brother who became famous for his devotion to the Blessed Sacrament. In 1897 Pope Leo XIII declared him patron saint of eucharistic congresses and associations. Patrick Duffy tells his story. Born in Torre Hermosa on the borders of Castile and Arragon of a poor shepherd family, Paschal tended flocks as well as getting an elementary and religious education. In his early twenties he joined the reformed Friars Minor of Peter of Alcantara as a lay brother. In his capacity as porter, he had ample opportunity to care for the sick and be generous to the poor. Once he locked himself in the refectory and did an elaborate dance before a statue of Our Lady. But he is especially known for his devotion to serving one Mass after another and his deep mystical prayer before the Blessed Sacrament. Once he was entrusted with a mission as a courier to bring letters from the Spanish Minister of the Friars Minor to the Breton Minister-General. On the way he was attacked by Huegenots, who stoned and seriously injured him. However, he succeeded in the mission on which he was sent and returned to Villareal where he died aged fifty-two. Many cures and miracles were reported at his tomb. He was beatified in 1612 and canonised in 1690. In 1897 Pope Leo XIII declared St Paschal Baylon patron of eucharistic congresses and associations. During the Spanish Civil War (1936-39) his relics were burned by the Red Terror.